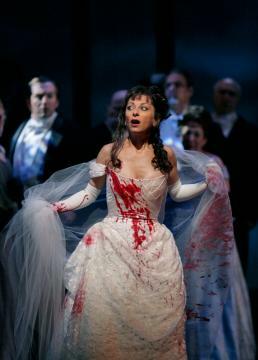 I like Donizetti a lot, and Lucia Di Lammermoor is his masterpiece I feel. This Met production is very solid as you would expect from the Met, but my favourite Lucias are the 1983 production with Sutherland(my personal favourite Lucia) and Kraus and the recording with Sutherland, Pavarotti, Milnes and Ghiaurov. The costumes and sets are suitably sumptuous, helped by the atmospheric lighting and skilled camera work. The music is magnificent, and done justice by the orchestra, chorus and conducting, while the sound . 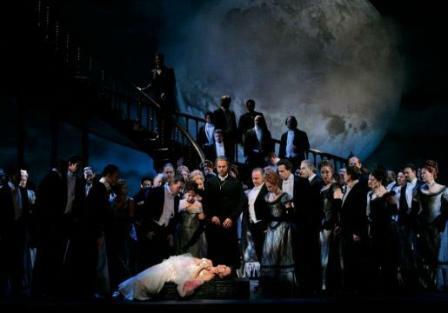 The staging is fine too, the Mad scene is the highlight of the opera for me and it is staged with finesse, is very evocative and Dessay is the best here of the entire production. That is though not to exclude the Sextet either, which is a real treat musically and quite clever in its staging. Performances are great in general. The biggest surprise was Joseph Calleja as Edgardo. I am generally not really a fan of Calleja, but seeing how ardent he was, how vocally resourceful and expressive he was and how magical his Tombe Degli Avi Mei and Tu Che a Dio Spiegasti I Ali were, he's starting to grow on me. And need I mention how superb he was in his final scene? Ludovic Tezier with his rich voice and powerful acting makes for a scheming yet also sympathetic Enrico. Natalie Dessay has some fine moments such as her exquisitely matched duets with Calleja and the Mad scene but is past her best vocally. This is a different role to what I am used to see her playing, this is not Olympia, Orphelie or the title role in La Fille Du Regiment, so her original and vibrant stage presence is toned down here. 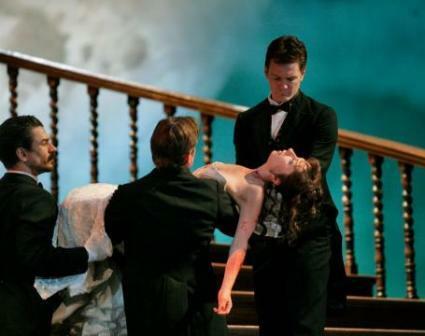 She handles the tragedy very well and makes the Mad scene as vivid as she possibly can. 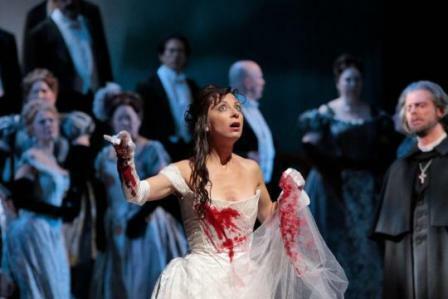 What I mean by her being past her best is that although the colouratura and technique are still there, the high notes don't quite have the ring they used to and have a tendency to be preceded by lunges a little too desperate.